Here are some interesting knives in the Wenger 75mm category. You can find some information on the internet and information about numbers with names. 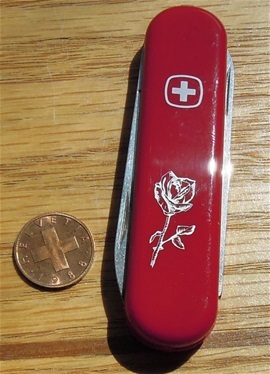 The models with the embossed icon of a rose may have been introduced around 1976 but this is so far just to have in mind. What is sure is that these knives have variations on the emblems, construction and icons with the embossed or pad printed type. 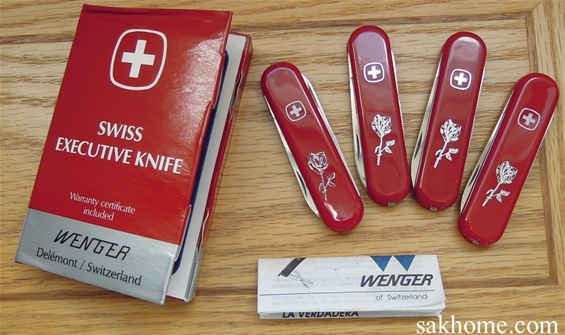 It is obvious that these knives can be directed at women. Wenger introduced a special 1.83.40 set with a coin and special box. 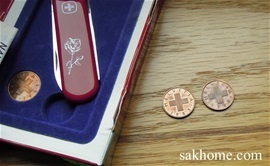 The coin is a part of folklore and traditions with a gift knife. The two different constructions are interesting and that this knife was produced for a good time because you can find the embossed icons and the pad printed type. On the pictures are knives from the late 70s-1990s. You can find that the emblem may have a silver embossed type or a white type. You can also find a pad printed emblem. There are different sets of knives made with different numbers. 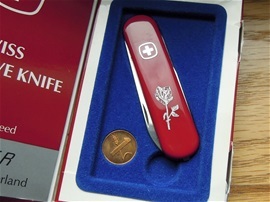 You can also find that this knife can be directed at different markets. 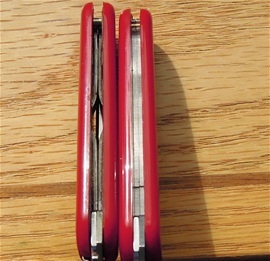 You can also find knives from the 70s that got scissors without serrations. 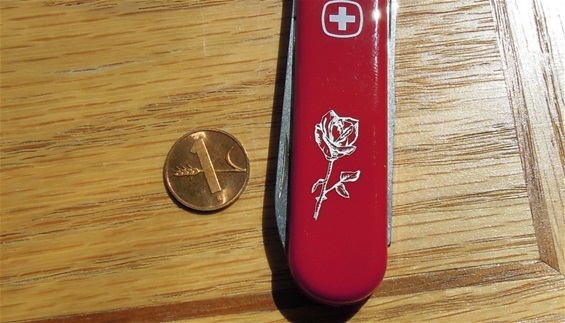 With the rose on the handle then we are talking about the “personalized series” usually. 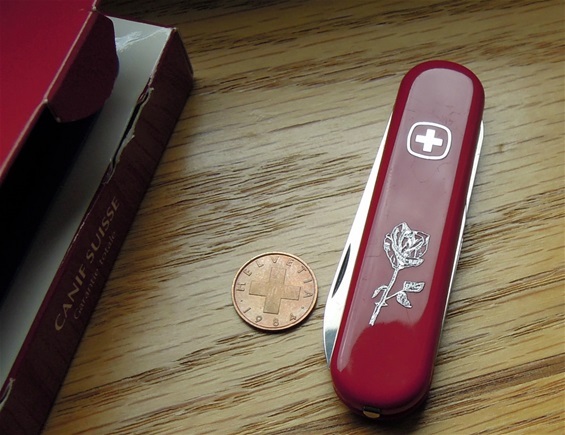 The coin is a Rappen and sometimes it can be used as a helpful tool with dating a knife but sometimes not. 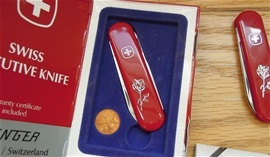 I have seen 75mm knives from 1976 with such a coin. A good thing is to always keep the boxes! Here is a bit of a mystery but maybe not This knife got the same number 1.83.40 on the box and it got the old construction. The coin is from 1984 so i would believe you can find the old construction in this set. I know the embossed icons can be found so why not. I am not sure if it`s been misplaced but i like it! In patent applications i found the old construction with a completely different spring assembly in the early 1970s. The knife on the left got this type. Some refer these knives as a V.I.P. 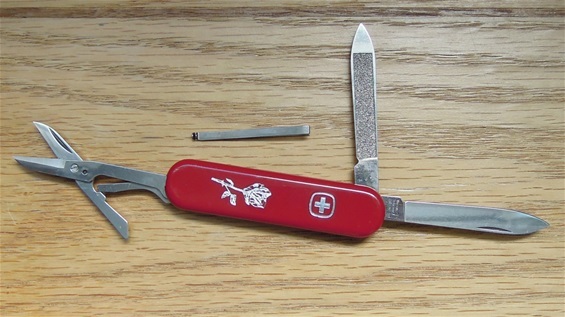 This is a knife that Wenger invented in 1976. The old spring system is special and integrated from the liners and it is not the typical sandvich constructions.